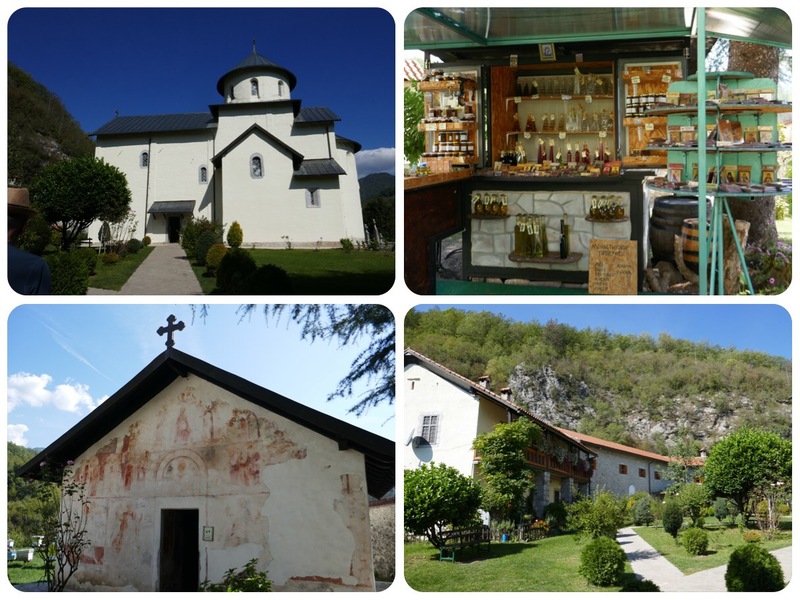 On our drive from Kolasin towards the city of Podgorica, we stopped along the road that follows the Morača River, to visit the beautiful Morača Monastery. The Morača Monastery is a Serbian Orthodox monastery founded in 1252 by Stefan Vukanović Nemanja, the son of King Vukasin and grandson of Nemanja. The Monastery is surrounded by a manicured garden, and there is a small community of caretakers and monks living there. They maintain an enviable, weed free vegetable garden, a small honey production with a garden filled with wooden bee hives, and their sleeping quarters are made of local stone with flowers, grapevines and large zucchini vines hanging from a pergola. The most impressive building in the complex is the Monastery Church chapel. Beside the beautiful architecture with its high arches, every inch of the walls is covered by amazing fresco paintings. The artistic beauty of this monastery is famous, mainly because of the frescoes, which were first painted in the 13th century and then added to in the 16th century; all are maintained in very good condition. One of the paintings that touched me was a painting of Saint Onouphrios with very long grey hair and a long beard, dressed in a humble garment made of human hair woven to look like leaves. Saint Onouphrios lived in the desert in Egypt and there he achieved enlightenment, surviving on food like dates and herbs, or heavenly food that manifested for him from the Universal. Much like the deities that I saw painted on the walls of Buddhist and Hindu temples, they all have great stories to tell. There are innumerable stories of enlightenment, devotion, spiritual bravery, divine Grace, miraculous healings and spiritual revelations. This is the first time in my life that I have been inside Serbian Orthodox churches and monasteries, and I am so inspired by the stories of these saints. In the city of Podgorica, our first mission was to find a place to do our laundry. We had not able to find even one coin laundry shop during our travels in Montenegro until then. Our Hilton hotel receptionist gave us the address of the laundry service that the hotel uses, and we walked there and gave them our large sack of laundry. Then we continued walking the streets, looking to find good places to eat and things to see. Our walk took us to the Serbian Orthodox Church, a massive community church which is a pilgrimage place for people to come and pray. We were fortunate to come right when the evening service started. The people stood up, and spread out around the large and tall halls of the church. In an inner sanctum, the priest chanted and in between prayers, a female singer with a beautiful voice sang hymns. We stood between the devotees who crossed themselves periodically and a group of Chinese tourists, snapping photos with their cell phones. To be honest, Jules and I also took dozens of photos, only because the paintings in the church and the design of the building were so stunning. The songs and the service were beautiful. In a nearby park we visited the Contemporary Art museum, located in the old king Nikola Petrovic’s summer palace. We saw a wonderful exhibition of abstract paintings by the artist Vaso Nikčević. In the same park, there was a small Serbian church and the caretaker there gave me a bracelet with all the icons of the Serbian church saints. He also showed me how they burn black brick incense to smudge and purify the energies of your home. Walking around a town that does not get many tourists was truly fun. Everywhere people stopped us and asked us where we came from, and how we liked Montenegro. We felt that we were seeing a place that had not changed its skin to accommodate the tourists. We ate a very good meal in the “Republic of good food,” with fresh juices, salads and lots more choices, but we could not eat too much. For dinner, we did as the locals do, and bought fresh Burek from a Burek stand in the middle of town. The stall has a large oven and two smiling ladies who only make Burek and nothing more. They have a meat Burek, a cheese Burek and a spinach Burek. We bought two spinach Burek and ate them in our comfortable and new hotel room. Podgorica might not be a top destination by itself, but it is along the way and it offered us an opportunity to reorganize, do our laundry, and spend the day in comfort.